Do you love ranch dressing on your salad, veggies, or potatoes? The creamy condiment is a favorite in many kitchens. But ranch salad dressing that you buy in the store and even the kind that you make at home is loaded with fat and calories. To make matters worse, many diet versions of ranch dressing contain added sugars or other artificial thickeners. Instead, use these easy swaps, tips, and salad dressing recipes to cut calories and make a healthier salad. There are about 16 grams of fat and 148 calories in a single serving of ranch salad dressing, although the exact number can vary slightly depending on the brand that you buy and whether or not you make it at home. The number doesn't sound too bad, especially considering that you're probably adding it to a healthy salad bowl full of vegetables that are naturally low in fat and calories. But you are probably adding more than a single serving when you top your salad. A single serving of ranch dressing is only two tablespoons. How often do you take out a spoon and measure the creamy topping? When you pour salad dressing straight from the bottle, it's easy to add more than you need. And if you are dipping veggies or chips into the sauce, you're likely to mindlessly consume more than a single serving. A healthy salad can quickly turn into a diet disaster if you add too much high-fat salad dressing. Many dieters also add other fatty ingredients such as cheese, nuts, seeds or croutons. Your salad can top 700 calories or even more. If you want to cut calories in your salad, swap ranch dressing for a lower calorie alternative. You can purchase a lower calorie or low fat version of ranch dressing that you find in the grocery store. 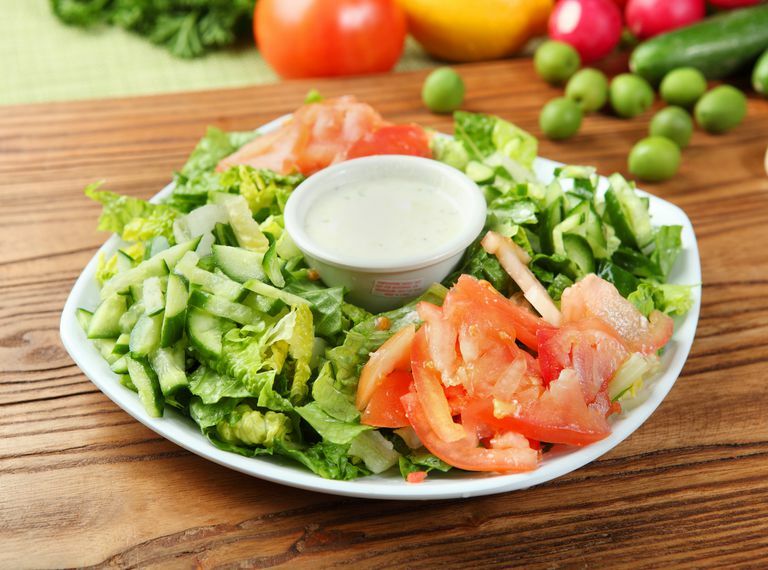 A typical brand of light ranch-style salad dressing provides 80 calories and 7 grams of fat in a two-tablespoon serving. Fat-free ranch dressing provides just 30 calories and zero grams of fat. But some fat-free salad dressings list corn syrup and sugar as initial ingredients. If you're trying to cut back on added sugars, this might not be the healthiest alternative. In addition, many consumers find that low fat salad dressing don't taste the same as the original versions. The best way to reduce salad dressing calories is to use less of it. Even though two tablespoons is listed as the serving size on many packaged bottles of ranch dressings, it doesn't mean you have to use that much. Use half the amount and sprinkle your salad with fresh herbs and other seasonings for additional flavor. Here are more clever tips that make it easier to cut back on the amount you use. Order dressing on the side at restaurants. Most restaurants overdress their salads. Always order dressing on the side to cut calories. Or if you prefer your salad pre-mixed, request that the chef use half of the usual amount. Use the dip trick. Rather than pouring dressing on your salad (or having it dressed for you) keep your dressing on the side. Then before grabbing a bite of salad, lightly dip your fork in the salad dressing. You'll get just a tiny bit of dressing on the tines—just enough to add savory flavor to the greens that your fork picks up. Make your own ranch-style salad dressing. If you eat your salad at home or pack it for lunch, make your own dressing. That way you control the ingredients and the calorie count. Simply combine nonfat (skim) milk, low-calorie sour cream and a small amount of mayonnaise with a Hidden Valley Ranch powder mix. Or for a less processed alternative, skip the powdered mix and add your own fresh onion, garlic and herbs to the dairy mixture instead. Combine the ingredients in a shaker bottle and blend thoroughly. If you refrigerate the dressing for an hour or more, it will thicken slightly to give you the creamy texture that you love. There are plenty of low-calorie and low-fat salad dressings that you can use to top your salad. Experiment with any of these salad dressing recipes to cut calories and fat from your meal. Low Carb Greek Lemon Garlic Dressing. This zesty dressing is a perfect addition to a fresh salad and can also be used as a marinade. It's also a great way to get olive oil into your diet. Each tablespoon has just 94 calories. Low Carb Strawberry Vinaigrette Dressing. If you're looking for something a little sweet, this strawberry dressing is for you! A 2 tablespoon serving comes in at 123 calories. Cranberry Vinaigrette Dressing. The dressing gives you a twist on standard fruit vinaigrettes by using cranberries. You can use fresh or frozen, and each 2 tablespoon serving has about 100 calories.